The Final Big Finish Update! And it's a short one; the seat plaques have been installed...and they look lovely! We hope you agree. 44 More Named Seats in the Refurbished Grandstand are now available on a first come, first served basis. Follow this link, complete the form and we’ll be in touch with everyone on or after April 29th with further details. Exciting news: We’re not quite finished! 44 More Named Seats in the Refurbished Grandstand are about to become available. Thanks to a final re-jig of the plans a whole new front row is up for grabs. 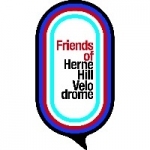 It’s one last chance to get your very own named seat at Herne Hill Velodrome.